Here at the Farm Playschool we provide a warm and caring environment for your child to learn and grow. 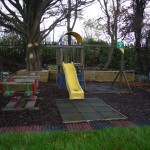 We have a wonderful outdoor area for the children to play in. We also have a wide and varied range of animals for the children to see and learn about. Through this interaction with the animals and the outside world they develop a greater understanding of the world that they live in. The Farm Playschool was established in the early 80’s and has gone from strength to strength. We are a community based facility catering for the local area. As we have been providing this service for such a long time now we are beginning to see past pupils bringing their own children back to receive the wonderful care that they received as children. We provide a sessional playschool service for children aged between 3 and 5 years. Our opening times are 10.00 am to 1.00 pm Monday to Friday.